Mix all the ingredients for the crepe batter together. Whisk until well combined and smooth. In a small pot, over medium low heat, add the strawberries, water and sugar. Cook the strawberries down until the mixture has thickened to a loose jam. In a small bowl, stir together the ricotta, orange zest, orange juice and powdered sugar. They cook quickly. Once very lightly browned flip the crepe over using a flexible spatula and cook on the other side again until just lightly golden. Place the crepe on a plate and cover with foil as you continue cooking the remaining crepes to keep them warm. Be sure to spray between each crepe to prevent sticking. To serve, lay a crepe out, smear a thin layer of ricotta on top. Fold in half twice to get a triangular shape or you can just roll up the crepe. Top with some of the warm strawberry sauce. love the weekends! I mean who doesn’t, right? I love the extra family time, no alarm clock going off and delicious extra special breakfasts like this one! 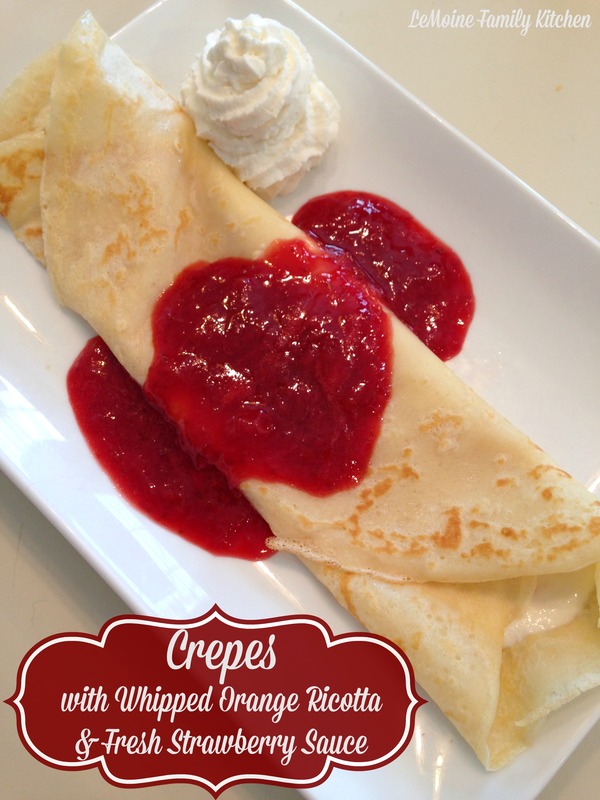 Crepes with Whipped Orange Ricotta & Fresh Strawberry Sauce are absolutely spectacular! I can’t even describe to you how much we enjoyed these beautiful light crepes, the slightly sweetened whipped orange ricotta and to top it all off a sweet fresh strawberry sauce. This is one perfect dish and would make for a special treat on Valentines Day too! 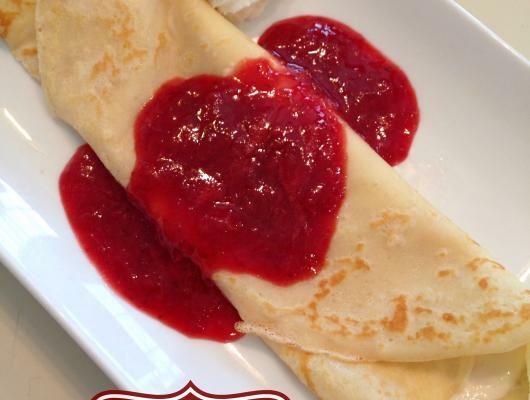 Heres what I really love about these Crepes with Whipped Orange Ricotta & Fresh Strawberry Sauce…. everything!!! The crepes themselves are really light and the batter is simply flour, milk, eggs, baking soda and powdered sugar. Have you ever had a sweetened ricotta? It is really wonderful! I love the brightness that the fresh orange juice and orange zest add to the creamy mild Italian cheese. Pairing all that with a fresh strawberry sauce finishes this dish off wonderfully!